Stir Fry 101 - Sobeys Inc.
To – Stir-Fry means to cook foods over high heat, moving them constantly with a utensil, in a small amount of hot oil. 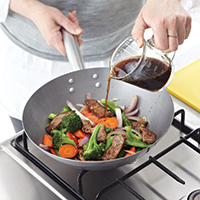 Stir-frying is best done using oils with a high smoke point. 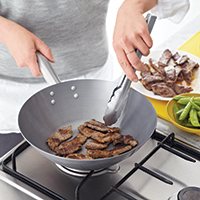 This technique is often used in Asian cuisine to create dishes that feature small pieces of meat, poultry or tofu; tender-crisp vegetables; and a savoury pan sauce. Peanut oil is the favourite in Asian cuisine, but safflower and canola oil are other easy-to-find, reasonably priced options. 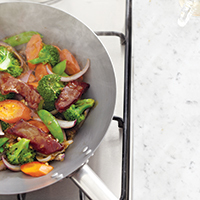 You’re only five steps away from becoming a stir-fry pro. 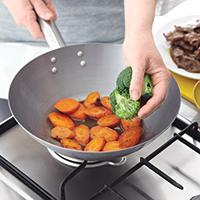 Use the largest wok or heavy skillet that fits on the burner to avoid overcrowding the vegetables. Choose utensils that can stand up to high-heat cooking, like wood and silicone. Cut ingredients into uniformly sized pieces to help ensure even cooking. Since stir-fries cook quickly and need to be stirred constantly, place all the ingredients close to the stove. Add oil to the skillet and heat over high heat. Most recipes will specify the cooking order of ingredients. Typically meat is cooked first and then set aside. Next, large or hard vegetables are cooked, followed by smaller and more delicate ones. 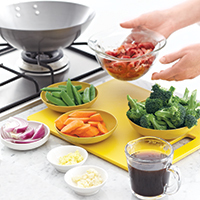 Cook vegetables in batches, if necessary, to avoid overcrowding the pan. Finally, add the sauce and cook until it thickens to desired consistency and is warmed through, then add back in any meat or vegetables that were removed and set aside. For more cooking tips and recipes, visit: https://www.sobeys.com/en/recipes.